“TECFIDERA’s compelling combination of benefits has made it the most-prescribed oral MS medication globally.1 At ECTRIMS, Biogen will present data that underscore the benefits of early treatment of RRMS with TECFIDERA and reaffirm its favorable benefit-risk profile in a broad range of patients,” said Gilmore O’Neill, M.D., vice president of Multiple Sclerosis Research and Development at Biogen. 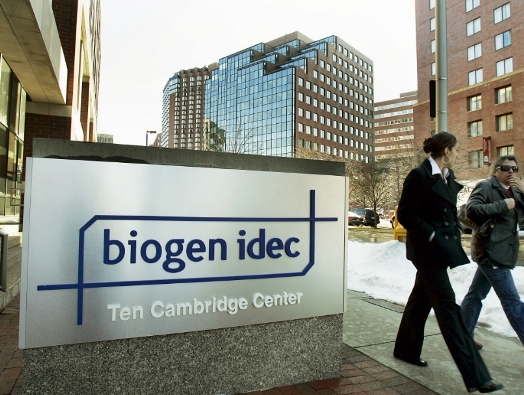 Biogen will also present additional findings from studies of its marketed and investigational MS therapies that aim to improve patient outcomes. Highlights include results from new analyses of the Phase 3 study of ZINBRYTATM (daclizumab high-yield process) and additional Phase 2 results for anti-LINGO-1 (BIIB033) in acute optic neuritis. Further clinical data presentations from company initiatives and collaborative research will focus on exploring innovations and technologies to enhance individualized treatment outcomes. TECFIDERA has been proven to reduce rate of MS relapses, slow the progression of disability, and the number of MS brain lesions, while demonstrating a favorable benefit-risk profile in a broad range of patients with relapsing forms of MS. 5 In clinical trials, the most common adverse events associated with TECFIDERA were flushing and gastrointestinal (GI) events. Other side effects included a decrease in mean lymphocyte counts during the first year of treatment, which then plateaued. TECFIDERA is contraindicated in patients with a known hypersensitivity to dimethyl fumarate or any of the excipients of TECFIDERA. Rare cases of PML have been seen with TECFIDERA patients in the setting of severe and prolonged lymphopenia. The efficacy and safety of TECFIDERA have been studied in a large, global clinical program, which includes an ongoing long-term extension study. It is believed that TECFIDERA treats MS by activating the Nrf2 pathway, although its exact mechanism of action is unknown. This pathway provides a way for cells in the body to defend themselves against inflammation and oxidative stress caused by conditions like MS.
TYSABRI is a DMT approved in more than 65 countries. In the United States, TYSABRI is indicated as monotherapy for the treatment of patients with relapsing forms of MS. In the European Union, it is indicated as a single disease modifying therapy in highly active relapsing-remitting MS for adult patients who have high disease activity despite treatment with a beta interferon or glatiramer acetate or patients with rapidly evolving severe RRMS. TYSABRI increases the risk of progressive multifocal leukoencephalopathy (PML). When initiating and continuing treatment with TYSABRI, physicians should consider whether the expected benefit of TYSABRI is sufficient to offset this risk. TYSABRI increases the risk of PML, an opportunistic viral infection of the brain which usually leads to death or severe disability. Risk factors that increase the risk of PML are presence of anti-JCV antibodies, prior immunosuppressant use, and longer TYSABRI treatment duration. Patients who have all three risk factors have the highest risk of developing PML. TYSABRI increases the risk of developing encephalitis and meningitis caused by herpes simplex and varicella zoster viruses. Serious, life-threatening, and sometimes fatal cases have been reported in the postmarketing setting in multiple sclerosis patients receiving TYSABRI. Other serious adverse events that have occurred in TYSABRI-treated patients include hypersensitivity reactions (e.g., anaphylaxis) and infections, including opportunistic and other atypical infections. Clinically significant liver injury has also been reported in the post-marketing setting. A list of adverse events can be found in the full TYSABRI product labeling for each country where it is approved. PLEGRIDY is a subcutaneous pegylated interferon dosed once every two weeks for relapsing forms of MS,6 including relapsing-remitting MS, the most common form of MS. PLEGRIDY is currently approved in the United States, the European Union, Canada, Australia, and Switzerland. Biogen continues to work toward making PLEGRIDY available in additional countries across the globe. The efficacy and safety of PLEGRIDY is supported by one of the largest pivotal studies with interferons conducted in people living with RRMS. In clinical studies, PLEGRIDY has been proven to significantly reduce the rate of MS relapses, slow the progression of disability, and reduce the number of MS brain lesions while demonstrating a favorable safety profile for patients with relapsing forms of MS. In clinical trials, the most common adverse events associated with PLEGRIDY were injection site reactions and flu-like symptoms. Other side effects reported include liver problems, including liver failure and increases in liver enzymes; depression or suicidal thoughts; serious allergic reactions; cardiac problems, including congestive heart failure; autoimmune disorders; decreases in white blood cell or platelet counts; and seizures. A list of adverse events can be found in the full PLEGRIDY product labeling for each country where it is approved. It is believed that PLEGRIDY modulates immune responses that are thought to play a role in MS although its exact mechanism of action is unknown. For additional important safety information and United States full prescribing information, please visit www.plegridy.com, or your respective country’s website. ZINBRYTA (daclizumab high-yield process) is an investigational compound being developed for the treatment of relapsing forms of MS. ZINBRYTA is a new form of a humanized monoclonal antibody that selectively binds to the high-affinity interleukin-2 (IL-2) receptor subunit (CD25) that is expressed at high levels on T-cells that become abnormally activated in MS. ZINBRYTA modulates IL-2 signaling without causing general immune cell depletion. Biogen and AbbVie are jointly developing ZINBRYTA. ZINBRYTA is believed to work by decreasing abnormally-activated T-cells and pro-inflammatory lymphoid tissue inducer cells, and increasing CD56bright natural killer (NK) cells, important cells that help regulate the immune system. ZINBRYTA is currently under regulatory review in the United States and the European Union. Anti-LINGO-1 (BIIB033) is an investigational compound being developed for the treatment of multiple sclerosis. Anti-LINGO-1 is a fully human monoclonal antibody that targets LINGO-1, a protein expressed selectively in the central nervous system (CNS) that is known to play a central role in regulating axonal myelination and regeneration. Two global Phase 2 trials, RENEW and SYNERGY, were designed to assess the biological activity and clinical potential of anti-LINGO-1 in acute optic neuritis (AON) and relapsing forms of MS. In RENEW, anti-LINGO-1 was evaluated in patients following a first episode of AON. Anti-LINGO-1 demonstrated an improvement in recovery of optic nerve latency (time for a signal to travel from the retina to the visual cortex) relative to placebo. RENEW was the first clinical study to provide evidence of biological repair in the CNS by facilitating remyelination following an acute inflammatory injury. SYNERGY is a separate Phase 2 study which aims to measure the impact of anti-LINGO-1 in combination with an anti-inflammatory therapy on improving and slowing disease progression among participants with relapsing forms of MS (both relapsing-remitting MS and secondary-progressive MS). The study is ongoing with results expected in 2016. This press release includes forward-looking statements, including statements about the potential benefits of our products and programs and expected timing of results from clinical trials. These forward-looking statements may be accompanied by such words as "anticipate," "believe," "estimate," "expect," "forecast," "intend," "may," "plan," "will," and other words and terms of similar meaning. You should not place undue reliance on these statements. Drug development and commercialization involve a high degree of risk and only a small number of research and development programs result in commercialization of a product. There is a risk that positive results in a clinical trial may not be replicated in subsequent or confirmatory trials or success in early stage clinical trials may not be predictive of results in later stage or large scale clinical trials or trials in other potential indications. Other factors which could cause actual results to differ materially from our current expectations include the risk that unexpected concerns may arise from additional data or analysis, regulatory authorities may require additional information or further studies, or may fail to approve or may delay approval of our drug candidates, or we may encounter other unexpected hurdles. For more detailed information on the risks and uncertainties associated with our drug development and commercialization activities, please review the Risk Factors section of our most recent annual or quarterly report filed with the Securities and Exchange Commission. These statements are based on our current beliefs and expectations and speak only as of the date of this press release. We do not undertake any obligation to publicly update any forward-looking statements. 2 Kappos, L., Freedman, M., Polman, C., et, al. (2007). Effect of early versus delayed interferon beta-1b treatment on disability after a first clinical event suggestive of multiple sclerosis: A 3-year follow-up analysis of the BENEFIT study. The Lancet, 389-397. 3 Goodin, D., & Bates, D. (2009). Review: Treatment of early multiple sclerosis: The value of treatment initiation after a first clinical episode.Multiple Sclerosis, 1175-1182. 4 Pozzilli C, Phillips JT, Fox RJ, et. al. (2015, October). Long-Term Follow-up of the Safety of Delayed-Release Dimethyl Fumarate in RRMS: Interim Results From the ENDORSE Extension Study. Poster session presented at the 31st meeting of the European Committee for Treatment and Research in Multiple Sclerosis (ECTRIMS), Barcelona, Spain. 5 TECFIDERA is approved in the European Union for relapsing-remitting multiple sclerosis. 6 PLEGRIDY is approved in the European Union and Canada for relapsing-remitting multiple sclerosis.